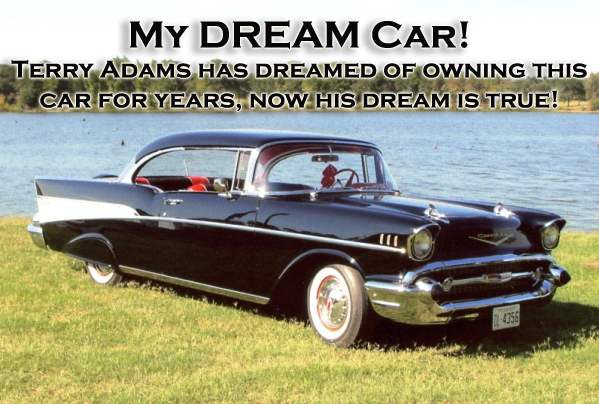 This ‘57 Chevy has always been my ‘Dream Car’. I never thought there was any car better looking in any way. The fins, hood, and aero dynamics are out of this world to me. I have been in the automotive field all my life. I started working on cars with my Dad, and went on from there. In 1970 started working with a rebuilding company which consisted of starters, generators, brakes, water pumps etc. Then in 1980 I branched out and started my own rebuilding business and put in an auto parts store in Rockwall Texas where I built cars, jeeps, trucks along with rebuilding and selling parts as far away as 5 states - but never a ‘57 Chevy. While I have always been looking for a ’57, I never bought one until 2015. It is a frame off restoration, V8-283, power-glide, red and black interior, power steering and a Continental Kit. It is very close to original. I did not build this ‘57 as I wanted a turn-key car and not have to wait out the build. This ‘57 was purchased from Street Dreams in Fredericksburg, Texas, which they purchased from the builder in Ft. Worth Texas. Since owning this car, it has never let me down and has always has won an award. So far I can say, “My dream came true”! I would like to say “Thank You” to the Dallas Area Classic Chevy Car Club for featuring my car this month and to both the Dallas Area Classic Chevy club and Reliable Chevrolet for the recent show which I was chosen as the Favorite ’57 Chevy.